"Yoo-Hoo, I'll make ya famous!" 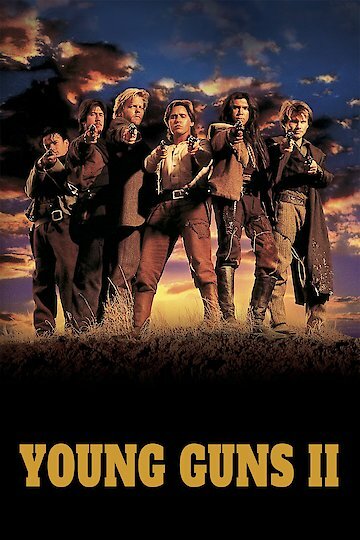 Young Guns II is the sequel to Young Guns, released in 1990. It follows the story of the further adventures of legendary Western outlaw Billy the Kid, played by Emilio Estevez. Kiefer Sutherland, Lou Diamond Phillips, and Christian Slater lend their support. The story follows Billy the Kid as he leads a band of vagrants called the Regulators on a rampage through the southwestern United States in the late 1800s. There is some creative license taken in the film with historic events, but it nevertheless makes use of real-life history, including the Lincoln County War, negotiations with New Mexico governor Lew Wallace, and Billy's betrayal at the hands of Pat Garrett. The film features a soundtrack by the band Bon Jovi, including the theme song Blaze of Glory, which made #1 on the Billboard Hot 100. Estevez originally approached Bon Jovi to seek the rights to their song "Wanted Dead Or Alive," but Bon Jovi preferred to write this song instead.